After I posted these photos of tea eggs I made a couple of weeks ago, a bunch of people asked what they were and how they’re made. 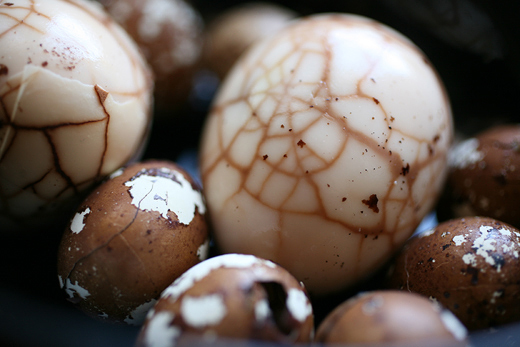 Tea eggs are a traditional Chinese snack, and are super-easy to make in bulk, thus providing extended snacking potential. I’ll list two recipes here – the traditional Chinese method and my own take. Place eggs in saucepan of cold water – water level should be a few inches higher than the eggs. Bring to a boil, then simmer for 2 minutes. 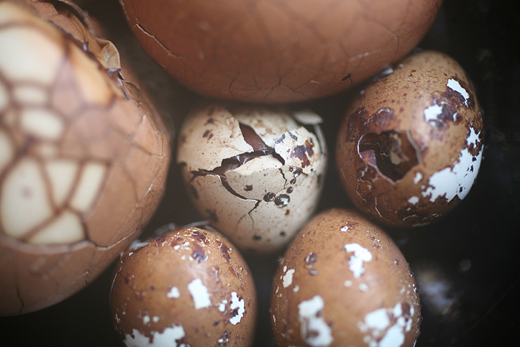 With a teaspoon, gently tap each egg in a few places to crack the shells. Add the tea and seasonings to the saucepan water and stir, then put the eggs back in. Cover and simmer for at least 2 hours – the longer the better – adding water as necessary. I like to cook these practically all day, adding water as it evaporates. The method remains the same as above. 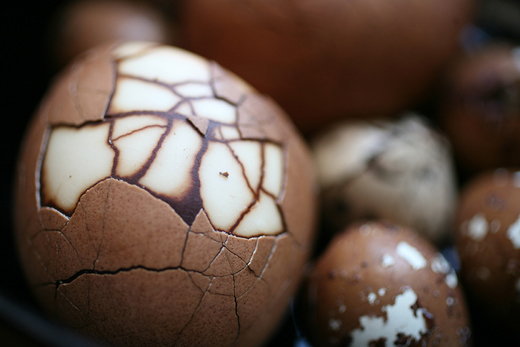 This is a sweet version of the savory traditional tea egg. The small eggs in these photos are quail eggs, which are incredibly good as tea eggs, because you can eat them whole [peeled, of course]. Mmmf! Wow, those are beautiful and sound delicious. They are so pretty. What do they taste like? I’m intrigued, had never heard of this snack. I love how they look. They look marvelous! If you were to cook them in bulk, how would you store them? Simply HAVE to try this. Tea and eggs? Two of my favouritist things everer! Not a fan of cinnamon or anise though… what else might go? Any savour ideas? I definitely need to try these out, they look so good! These look amazing! And to think I was just wondering what to do with the last few eggs in my fridge. I’m about to embark on an eggy adventure with a Matcha version. Fingers crossed.